Active parents love convenient outdoor gadgets, and thanks to Zigo, you can stay fit while hanging out with your little ones at the same time. We’ve all seen those flimsy bike trailers, with toddlers swaying precariously back and forth on open trails or busy street sidewalks. While some parents hold their breath and hope the safety ratings are accurate, others are investing in a Zigo with its four different traveling modes. Taking its cue from the traditional bike trailer, Zigo allows you to attach your child’s riding compartment onto the front of your bike, allowing you the chance to see how safe your child is riding. 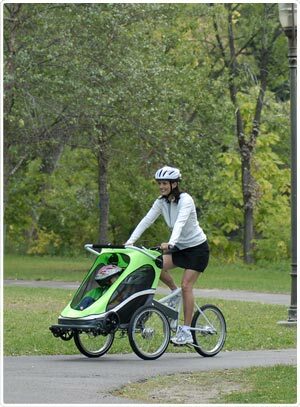 You can also use the compartment (known as a “child pod) on its own as either a standard or jogging stroller. Lastly, a 4th mode allows you to use the bike independently, for when you just need a little time for yourself away from the kids. 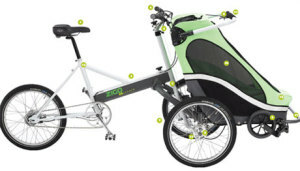 Available on both their official website and through various cycling shops through the U.S., Zigo continues to impress parents all over the nation.